Lucas Pope's first-person game lets you play detective on a ship of death. 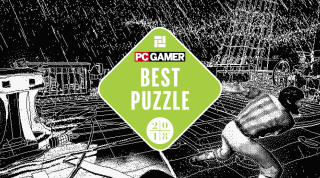 PC Gamer's Best Puzzle Game of 2018 is the fantastic Return of the Obra Dinn, by developer Lucas Pope. We'll be updating our GOTY 2018 hub throughout the rest of December with new personal picks and awards. Samuel: Like Her Story, this is a perfect detective game because it leaves enough space for you to actually figure out who you're trying to identify at any given time. You feel like a genius when you figure out the name of one character, then like a dunderhead when you're utterly stumped. Andy K: Return of the Obra Dinn could only exist as a videogame, and I always find that exciting. While steeped in the tropes of nautical fiction and classic whodunits, it’s something completely unique, forcing you to engage with the story, world, and mystery on a deep level. In those long periods where I couldn’t quite find the right clue to progress, I almost gave up. But then something would always click, toppling a domino chain of revelations in my mind, making me feel like the smartest detective in the world. This is one of the most satisfying puzzle games on PC, largely because it steadfastly refuses to hold your hand at any point. It trusts you to do it yourself, and is massively rewarding as a result. Pip: Props for the use of “dunderhead”, Sam. It’s spot on with this game. I think the thing I admire the most here is that Obra Dinn seems designed in such a way that epiphanies actually happen after you’ve been stumped a while. I’m not sure quite what it’s doing on a mechanical or design level to prompt that, but so many puzzle games have moments when you’re stuck and that stuck-ness never seems to shift. You’ve started thinking in the wrong way and can’t reset your brain, or a piece of the problem never clicks. But everyone I’ve chatted to about Obra Dinn seems to have been able to hit a wall and then, crucially, find a moment of inspiration that gets them through it. It’s a joy to work through. Phil: The difficulty ratings help a lot with that, Pip. Your job is to discover the identity of everybody on board an ill-fated voyage, and to work out how they died, using nothing but a notebook and a magical timepiece that lets you view the moment of their demise. Each picture in the notebook has a rating, telling you roughly how difficult the identity should be to work out. This stopped me from banging my head against puzzles I wasn't yet ready to solve. Instead, I mentally stored snippets of information, ready for the time I was finally ready to unpick the greatest mysteries. Tom: A chronological map of complete disaster aboard the unluckiest boat ever to have sailed in a videogame. I had no idea what Obra Dinn would become when I played a prototype a few years ago, but that prototype lacked the magnificent magic book that lets you build deductions from prompts in drop down menus. Once you lock three successful assessments, the book confirms the information and you’re free to move onto the dozens of other cases. Every details matters: dialogue, faces, even uniforms. I found myself googling ship terms and crew hierarchies and keeping copious notes on the side. I still don’t know why the game is rendered in two-tone Amstrad-era fuzzines, but it gives the game a dreamlike feel. I suppose the idea is that you’re wandering through ghostly memories that have lost their crisp edges. The effect takes the edge off the still moments of severe violence that form each of the game’s scenes, and it looks unlike anything else I’ve played before.